From 1984 to 1991 I studied astronomy at the Leiden University. In 1987 I got my Bachelors Degree ("Propedeuse" in Dutch). The lectures included not only astronomy but mainly mathematics and physics. Also computer science was important. I followed a lot of them. The Leiden Observatory (Huygens Laboratory). During the last part of my study I started a research project at the Leiden Observatory. Under the supervision of George Miley and Ken Chambers I worked on high redshift radio galaxies. My main task was reducing data taken with a radio telescope (Very Large Array) in New Mexico. In this period I attended a summerschool at the VLA where I learned a lot about the theoretical aspects of radio telescopes. Also problems with radio data and how to solve them where handled nicely. I met a lot of young astronomers at the summerschool. I'll look up the names later. We did not only study of course. We also had a party. People from all over the world were present (Spain, Argentina, Brazil). After I graduated in Leiden I got a two year position at the Leiden Observatory as a research assistant (TWAIO). My main task was to define the production pipeline of the Westerbork Northern Sky Survey. This meant writing automatic reduction scripts and source extraction software. Part of the WENSS project is done at the Netherlands Foundation for Research in Astronomy at Dwingeloo. I spend half of the time during the first seven months in Dwingeloo to test and debug the reduction software. An extra year was granted by ASTRON to finish all the last bits and streamline the project. Please note that I am NOT affiliated with the former camp Westerbork. I presented some of my work at a conference in Canada in 1993. Try if you can spot me in the picture. Since march 1995 I have been working as a senior software design engineer at SRON. I started working there for a project called XMM. 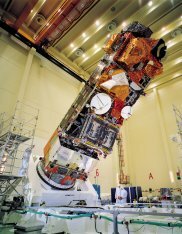 XMM is an X-ray satellite that will be launched in december 1999 by ESA. 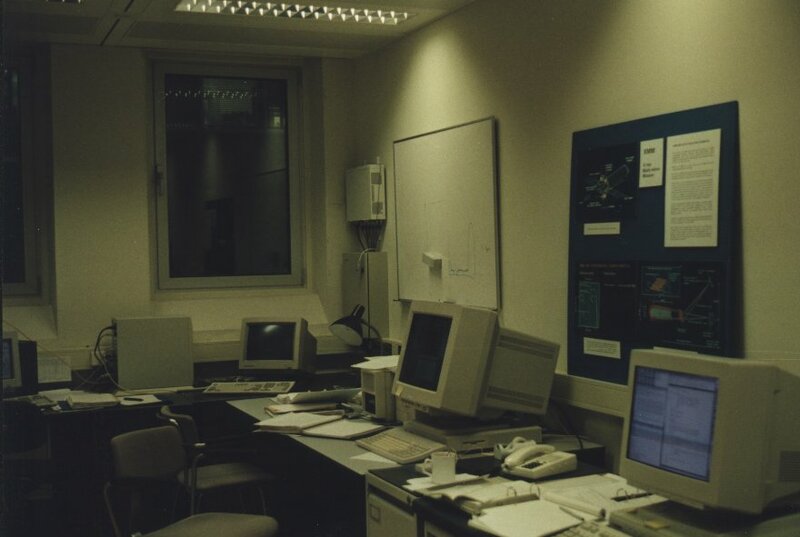 In january 1997 I went to another division of SRON (Earth Oriented Science) to work for the SCIAMACHY project. This is a joint project of The Netherlands and Germany , with participation of Belgium, for global atmospheric measurements. It has been selected by ESA to fly on the ENVISAT-1 polar platform and will be lanched in 2001. Then in july 1997 I went to yet another division of SRON, the Central Services Department (CD) to build SRON-Info - the SRON Intranet. In january 1999 I went back to my old project XMM. During the first year of its mission I have worked as an Instrument Specialist at the Science Operations Center of ESA in Villafranca in Spain. My first office at SRON. Down in the basement I spent a few months here trying to figure out how CCD's are working. XMM carries three identical, but independent grazing incidence telescopes, each consisting of a densely nested array of 58 paraboloid-hyperboloid mirror shell pairs in a Wolter Type 1 geometry. The telescopes have a focal length of 7.5 m. The mirror shells are 300 mm in length. The Reflecting Grating Spectrometer (RGS) consists of two independent instrument chains, utilizing the focussed X-ray light from two of the three telescopes. Each chain incorporates an array of reflecting gratings (RGA), which is attached to its respective mirror module. Since the detection in 1948 of X-rays from the Solar corona, many other cosmic sources have been identified as X-ray emitters containing hot gas at temperatures exceeding one million Kelvin. Such highly-ionized, hot gas is not restricted to the tenous densities of intergalactic and interstellar space but is also found in a large variety of other different astrophysical sources including: optically thin sources like Solar and stellar coronae, clusters of galaxies, galaxies themselves, supernova remnants, and, at higher densities, accretion-powered sources. The latter important catagory of sources include compact X-ray binaries, cataclysmic variables and active nuclei, where the central X-ray emitting region is surrrounded by a cooler medium that is partially photo-ionized. Other examples are early-type stars in which X-rays produced in hot plasma must be transferred outward through a stellar wind, and stellar sources located near the nucleus of normal galaxies which are surrounded by the local interstellar medium. X-ray spectroscopy has proven to be of major relevance in modelling all of these kinds of plasmas and studying the physical processes that release the energy and maintain the hot plasmas detected in the variety of cosmic X-ray sources, both inside and outside the Galaxy. Measurements of emission lines in such plasmas allow the determination of physical parameters such as: gas temperature and density, ionization state, elemental abundances, mass motions, and redshifts. The detection of absorption features provides similar information in cases where bright compact X-ray sources are embedded in cooler, extended gas clouds, which may be ionized by the X-rays. SRON is responsible for building the two spectrometers for XMM. A lot of work is put into the development of CCD's that can detected X-rays. In order to test these CCD's a large test facility is build to analize the devices. These facilities consist of a vacuum tank with cryogenic cooloing where X-rays can be produced. Because the measurements are usually time consuming this process has been automated. The software to produce script files (input files with selected parameters) for several software packages were written by me. This software is written in Tcl/Tk (a relatively new script language) and is platform independent. Without recompiling the source code can run on both the Sun workstation and on the PC running Windows. Script files are made for 1) a program that controls a slave PC (connected with RS-232 port), 2) the CCD control program and 3) a ORACLE database which stores the measurement parameters. With the Tcl/Tk software building scripts and linking them together into a batch file (a DOS based BAT file) is very easy. Since Tcl/Tk has build-in commands to make graphical user interfaces, it is just a matter of point and click to enable options like filters, fluoresent target, current and voltage of X-ray source, control voltages for the CCD, shutter control and cooling temperature. After a satellite is launched a lot of (scientific) data is send back to the astronomical institutes. These data have to be processed in order to do science with them. Nowadays most of this processing is done automatically. Because there are several missions planned within the high energy department a combined software platform has been developed to automate the data reduction. The software is written in C (with ORACLE preprocessor instructions) and Tck/Tk. The software that I have written for this project dealt with the data heritage. FITS files are used to store the parameters used by scientific software and these parameters are stored in a database. The Electrical Ground Support Equipment (EGSE) consists of a central workstation connected to a VME-crate which contains a number of processors and dedicated interface boards. At the central workstation the main EGSE program (Instrument Station) is running which controls the instrument through the dedicated interface hardware (Interface Simulator). This concept allows for gradual changes, depending on the phase of the program, including the replacement of the Interface Simulator by the Central Checkout System (CCS). Since january 1996 I have written software for the Spacecraft Simulator. This is C code running on a real-time operating system (VxWorks). My office at SRON that I have shared with Chiel and Erik. 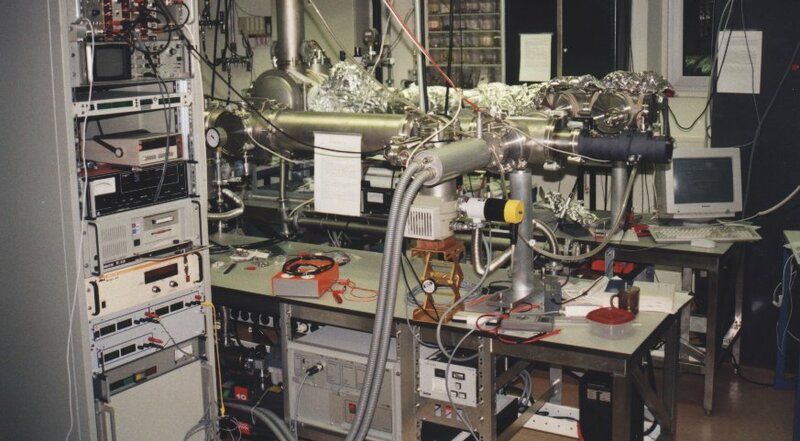 In 1996 a big measuring campain was held to test many parts of the instrument, like the spectrometer, the grating box and the mirror assembly. This test was done during a 7 week period in Neuried bei Munchen at the Panter Facility. I have worked on a new series of software routines to extend the SCOE (Special Check Out Equipment) that was used to test the Detector Modules of Sciamachy with some EGSE (Electrical Ground Support Equipment) functionality. Then you can also do some performance tests on the instrument, like checking the spectral resolution, bad/dead pixels, signal to noise and field of view. I also wrote software to test the alignment of the detectors. Most of this software is written in IDL. Sciamachy is one of the ten instruments on-board Envisat, the largest satellite ever build by ESA. It was launched on 1 March 2002. SRON-Info is the Intranet of SRON. This Web based system is made with both static HTML pages and software generated pages. It is made with Tcl/Tk with special Oracle extensions (Oratcl) to access the SRON database server. Modules like an address browser, document archive, and a purchase order system are build this way. Its a pitty that only people within the SRON organization can see it. For more then 2 years I have made software for this system and now others can maintain it. Build on the same framework as the Intranet is the Management Information System. It is almost finished now, but some work has to be done. This project was done in collaboration with Cap Gemini. Again the database is the central part here. Data is coming in from Excel (ODBC connection to Oracle), MS Project (also via ODBC), Afas (Financial system) and other tools and is stored into the database. Reports can be generated from your browser. Back on the old project, I still write software tools to make other people happy. In November 1999 I moved to Spain to work there for a year as Instrument Specialist. Near Madrid there is Vilspa (Villafranca del Castilla, Spain), where the Science Operations Center is located. The launch date for XMM was 10 December 1999. 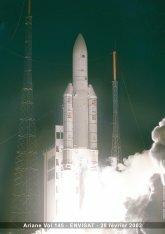 I have some information about the activities in Kourou (French Guiana) from the period just before launch. And also the launch itself. There is more to come, because the launch was succesful. Meanwhile I've made a page with the status reports for the first part of the mission. 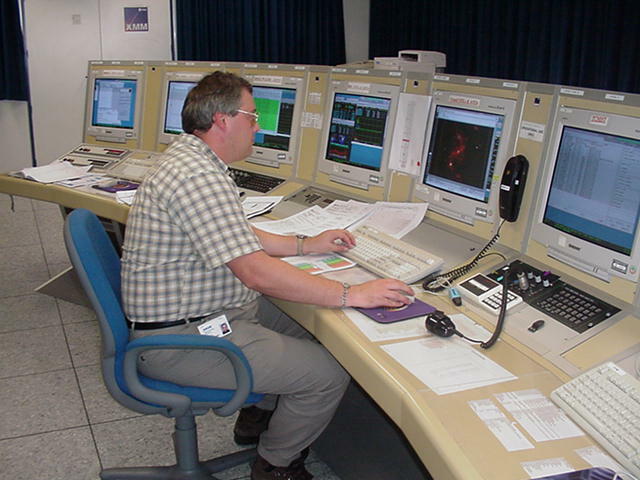 In January 2000 the first real work started in terms of operations: Commissioning. During this period all instruments are switched on for the first time and all different instrument modes are tested. This is also the moment when the first light pictures are made. 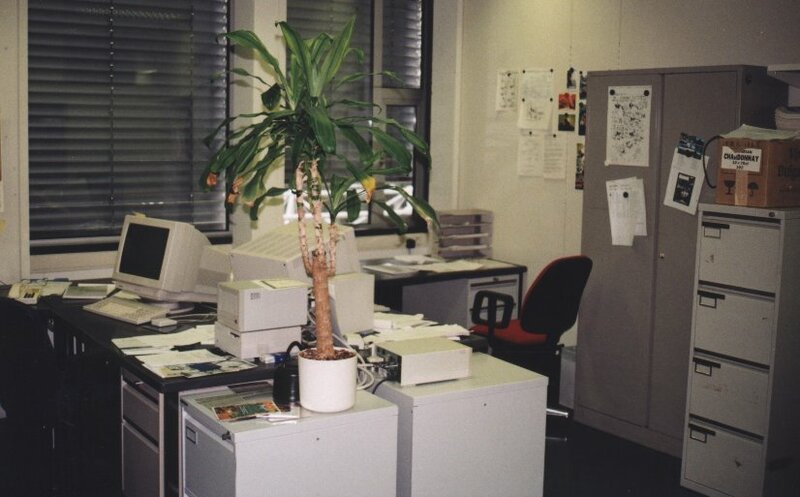 Starting from revolution 46 (9 March 2000) the next phase started: Calibration and Performance Verification (CAL/PV). Measurements are taken to test the performance of the instruments in-flight and to calibrate the instruments. For the RGS instruments the most important calibrations are the wavelength calibration and the effective area measurements. Meanwhile people are trying to take pictures from Earth using big telescopes to track down the satellite. You can see me in action at the INSCONs console at VILSPA. In revolution 102 the first guaranteed time data were taken. XMM-Newton is starting the routine measurements. At this point I got more time to work on software. So I build a package that contains all the information about all observations taken by all instruments on board XMM. This database in now used by both instrument specialists and the whole user community to find out what data has been taken by the satellite and under what conditions. In January 2001 I left VILSPA and returned to the Netherlands. I now work as a senior engineer for a British company called VEGA, in the Space Department. VEGA Group PLC is an Information Technology (IT) services company, which provides expert consultancy and applied technology to help companies optimise their business processes, successfully implement new technology and develop their staff. I am now working for a new project called Planck at Estec in Noordwijk. Planck is one of the European Space Agency's scientific missions planned for the first decade of the millennium. It has been designed to help answer key questions for humankind: how did the Universe come to be and how will it evolve. To fulfil its mission Planck will examine the first light that filled the Universe after the Big Bang, the Cosmic Microwave Background radiation (CMB). Planck will be launched in the year 2007, together with ESA's next infrared and submillimetre space observatory, Herschel Space Observatory (formerly called FIRST). I am a Ground Segment System Engineer, so I will help ESA and the institutes that build the instruments in organizing the scientific datastream into a homogeneous system.